Methyl Jasmonate is a plant stress hormone that has significant anti-cancer properties. So how does MJ work? Let me count the ways. 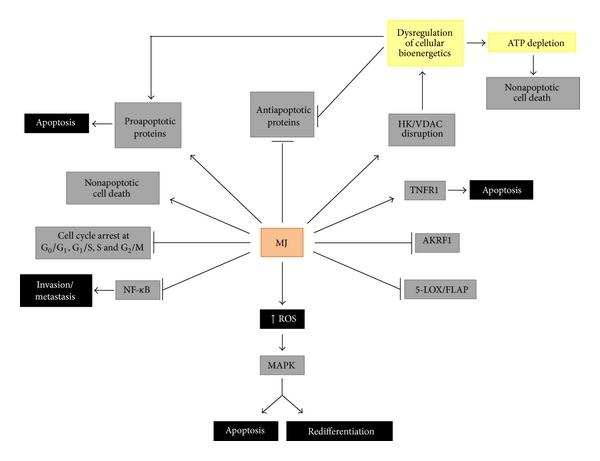 It arrests cell cycle, inhibiting cell growth and proliferation; causes cell death through the intrinsic/extrinsic pro-apoptotic, p53-independent apoptotic, and non-apoptotic (necrosis) pathways; detaches hexokinase from the voltage-dependent anion channel, dissociating glycolytic and mitochondrial functions, decreasing the mitochondrial membrane potential, favoring cytochrome c release and ATP depletion, activating pro-apoptotic and inactivating anti-apoptotic proteins; induces reactive oxygen species mediated responses; stimulates MAPK-stress signaling and redifferentiation in leukemia cells; inhibits overexpressed pro-inflammatory enzymes in cancer cells such as aldo-keto reductase 1 and 5-lipoxygenase; inhibits cell migration and shows antiangiogenic and anti-metastatic activities. The complete lack of toxicity to normal cells and the rapidity by which MJ causes damage to cancer cells, turns MJ into a promising anticancer agent that can be used alone or in combination with other agents.